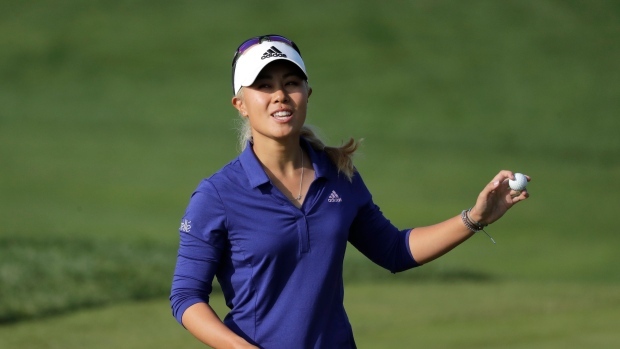 INCHEON, Korea, Republic Of — Danielle Kang and Charley Hull shot 4-under 68s to retain the lead after three rounds of the KEB Hana Bank Championship on Saturday while Canadian Brooke Henderson fired a 65 to make a move up the leaderboard. Ariya Jutanugarn was one stroke off the lead at 11-under 205 after a 69. Local favourite In Gee Chun shot a 66 and was two off the pace, tied for fourth with Minjee Lee (67) and Lydia Ko (68) at 10 under. Henderson, from Smiths Falls, Ont., offset a lone bogey with eight birdies that left her tied for 10th place at 5 under with four others, including Lexi Thompson (68). No. 1-ranked Sung Hyun Park, who shared the overnight lead, carded a 71 that included three bogeys and a double bogey. Kang started with two early bogeys but carded her sixth birdie of the day on the par-five 18th to finish at 12-under 204 with Hull, who also birdied the final hole in a bogey-free round at the Sky 72 Ocean Course. "I got off to a really slow start," Kang said. "My caddie talked me through a lot of shots and kept me together when I was getting annoyed. I'm a leaderboard watcher but he just kept telling me, 'You're putting great,' and that kept me in the game." Ariya got to 11 under at the turn, but bogeyed the 10th and could birdie only 13th. "I have a lot of things to work on," she said. "I missed some shots and started to think about making birdies and catching the leader and that's not helping. I have to try not to think too far ahead." Despite her erratic round, Park was only three shots off the pace, tied for seventh with Seon Woo Bae, who shot 67.